Important map showing the early development of the Van Diemen's Land or Tasmania colony. A beautiful map of the colony of Tasmania or Van Diemen's Land, Australia, from Sidney Hall's extremely scarce 1835 New General Atlas. The map covers the entire island of Tasmania as well as nearby Flinders Island (Great Island). This map exists in several known states, the present example being the second. This edition incorporates the results of numerous expeditions into the interior, an updated county system, and reveals an increasingly sophisticated internal road system. The map bears a number of interesting annotations including a comment describing how 'convicts are transported form Hobert Town to the settlement upon Sarah's I. in Macquarie Harbour.' 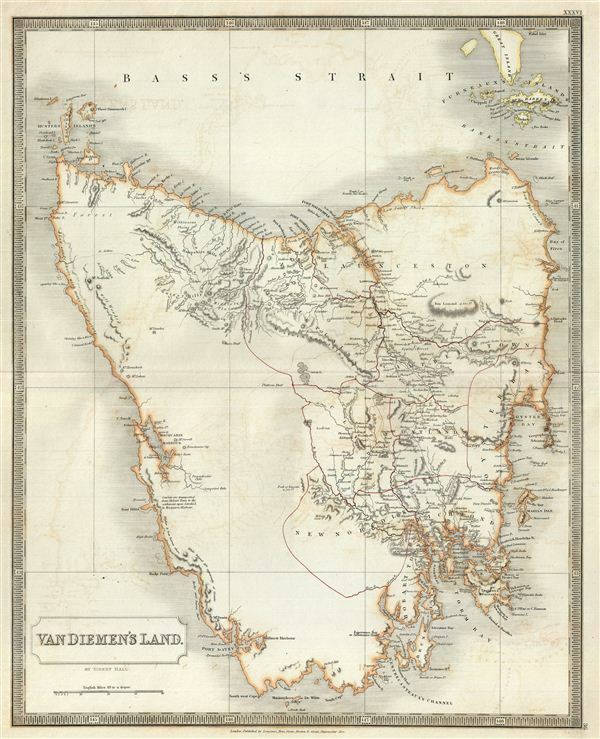 As this map was printed Tasmania was being aggressively colonized as a Penal Colony under the name 'Van Diemen's Land,' referring to the Dutch East India Company governor who sponsored Tasman's historic 1642 discovery of the island. The genocide of the Tasman aboriginal population also reached its tragic conclusion in this year, 1835, and the few reaming full blooded aborigines were transported to the 'sanctuary' of Flinder's Island. This is one of the few published maps of Tasmania from this period and an important record of the early development of the colony. A cornerstone map for any serious Tasmania collection. Very good. Minor wear along original centerfold. Original platemark visible. Blank on verso. Minor offsetting. Rumsey 4224.037 (1830 edition). Tooley, R.V., The mapping of Australia and Antarctica, 2nd ed., p. 92-93, no 687. Philips (Atlases) 758. National Library of Australia, 2113921; MAP F 514; MAP NK 10750/1; MAP RM 741; MAP T 687. Ristow, W., American Maps and Mapmakers: Commercial Cartography in the Nineteenth Century, p. 303-09.